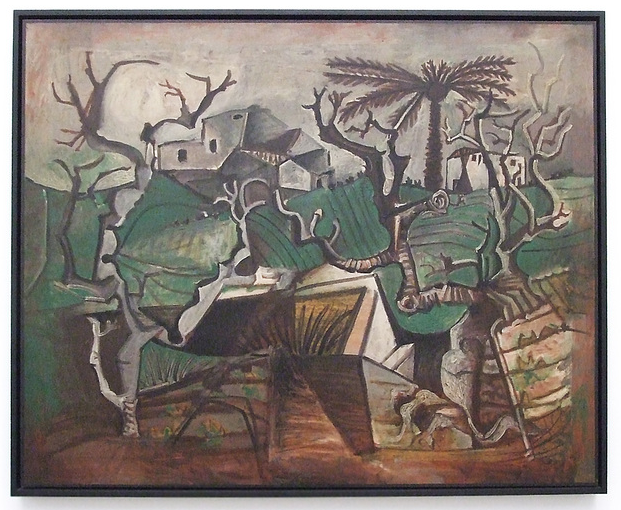 Picasso didn’t paint landscapes. And when he did, they always look figurative. Those two gnarly trees seem to be going at it for some reason. They look old – one older than the other. One seems to be propped up by a stake. Both are stripped of their leaves – bare, exposed. They argue. They bicker. They are waiting for spring. Waiting for the warmth and light. They are waiting for inspiration in the resting hills – waiting for rebirth. In the distance two dark houses sit empty – without life or light. And over there on the right – a dark palm tree god oversees the scene. Is he there to help or to harm? What does he want – so out of place in this scene? What – exactly – are these old trees waiting for? 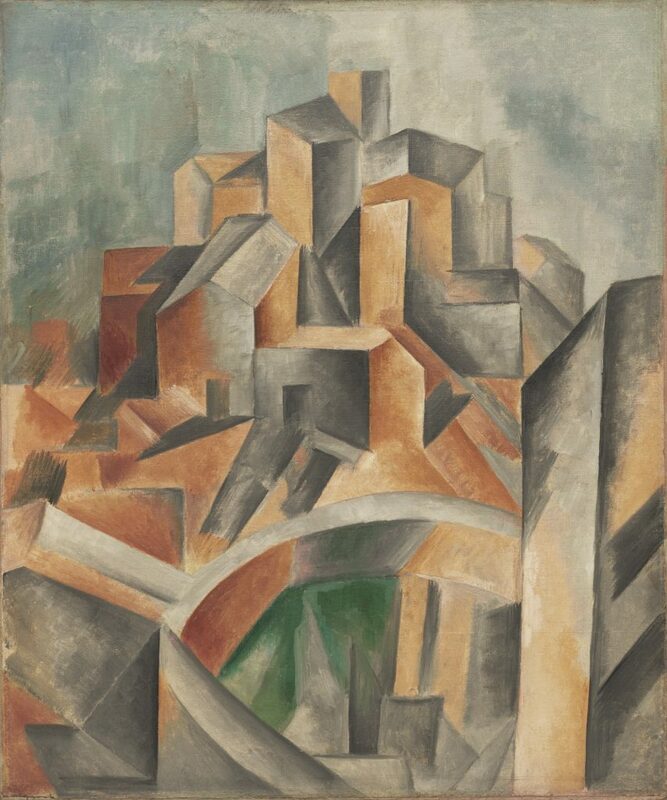 Of course we all know the Modern history – Picasso and Braque began to understand how Cubism would work by painting landscapes. They would break down the picture plane, show the world from back to front and top to bottom all at once. They stole a page from Cezanne’s book and painted the world through “little cubes” of information – an early precursor to our pixelated universe. 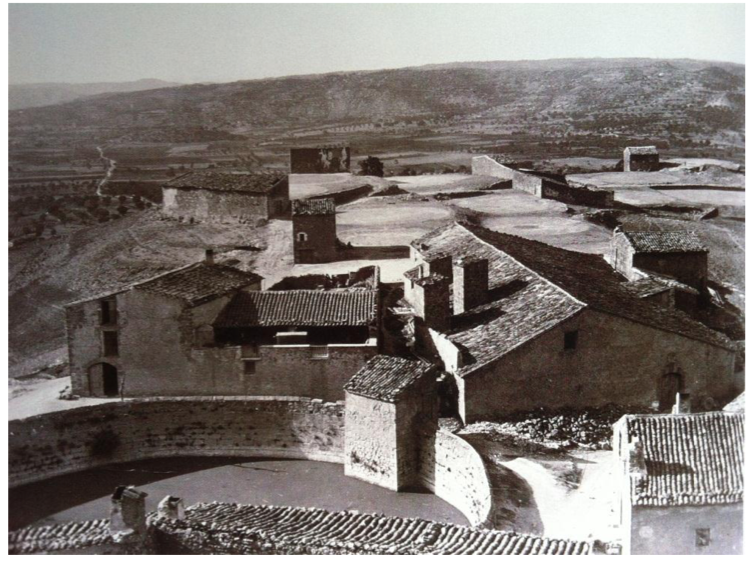 What isn’t widely known is that during this time both Picasso and Braque were taking photographs, hanging out at the picture shows and collecting postcards of people, landscapes and cultures from all over the world. Their Modern landscape would not only be a flat depiction of the world through process, it would also be inspired by the way machines of all kind had changed our perceptions of the world.